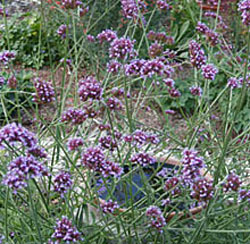 The masses of tiny purple flowers are on tall wiry stems, giving the plant a see-through quality. The flowers appear throughout the growing season. A butterfly favorite. It can be grown as an annual in cold climates. Categories: All Items, all potted plants, butterfly nectar plants, Potted Plants, More..